A simple, hearty dish with the creamy cheesiness of PHILADELPHIA. 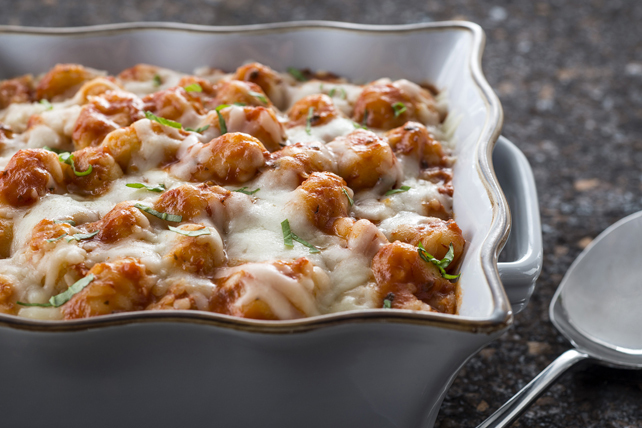 No need to cook the gnocchi first, just mix and bake. Heat oil in large skillet on medium-high heat. Add onions and garlic; cook and stir 5 min. or until onions are crisp-tender. Add tomato purée, sugar and crushed pepper; cook and stir 2 to 3 min. or until heated through. Add 3/4 cup cheese, gnocchi and 1/4 cup basil; cook and stir 2 min. or until cheese is melted and gnocchi is heated through, stirring frequently. Bake 45 min. or until heated through, uncovering and topping with remaining cheese for the last 10 min. Garnish with remaining basil.